The summer holidays are almost over and as you help your kids prepare for the school year ahead there are a million things racing through your mind. But as you rush to get their school uniforms ready and their back to school shopping complete, it’s important not to forget about their orthodontic treatment. 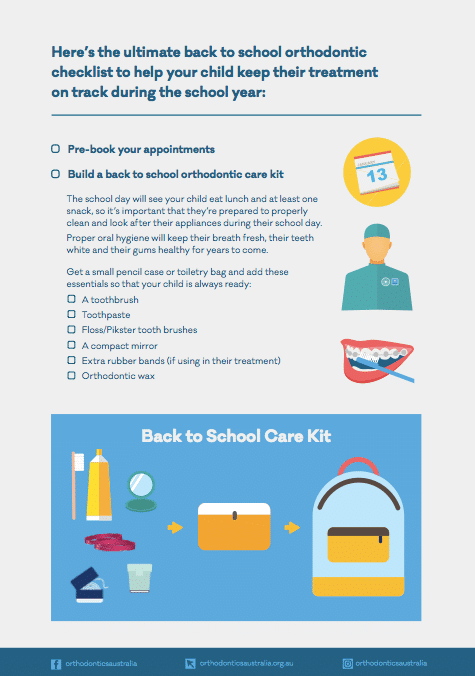 Whether this is the first time they’ll head to school with braces or have been undergoing orthodontic treatment for a while, it always helps to start the school year with all the essentials covered. The school year goes from zero to a hundred in the blink of an eye, so between homework and extra-curricular activities, it can be hard to find the time to squeeze in your orthodontic appointments. While undergoing any type of orthodontic treatment, you’ll need to have check up or adjustment visits at regular intervals with your orthodontist to ensure that active and correct tooth movement is occurring. Take the stress out of finding convenient appointment times for Term 1 by pre-booking your child’s next few orthodontic appointments. Once they’re all in your diary or calendar, this will reduce the stress of having to make last minute appointments. It also helps you to conveniently arrange the always “in-demand” before or after school appointments. The school day will see your child eat lunch and at least one snack, so it’s important that they’re prepared to properly clean and look after their appliances during the school day. Good oral hygiene will keep their breath fresh, their teeth white and their gums healthy for years to come. It may be beneficial to advise your child’s teacher if an appliance or braces has just been put on, in case your child is in any discomfort and may require an appropriate over the counter pain relief medication (E.g. Panadol or Nurofen) to help them get through a busy school day. If their treatment includes a removable device such as clear aligners or a plate, a spare plastic container in their schoolbag or lunchbox will give them somewhere safe to store it while they eat lunch (as lost devices can delay treatment progress and be costly to replace). Click on the image below to download your checklist.